This component retrieves data on a SendGrid database and loads it into a table. This stages the data, so the table is reloaded each time. You may then use transformations to enrich and manage the data in permanent tables. 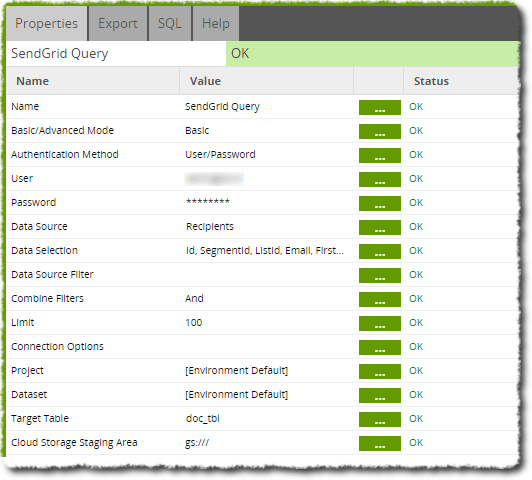 Advanced - This mode will require you to write an SQL-like query to call data from SendGrid. 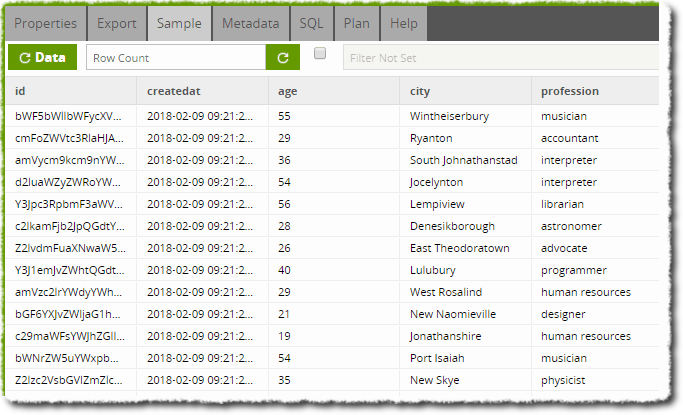 The available fields and their descriptions are documented in the data model. Authentication Method Choice Choose between authenticating using a username and password or with an API key. API Key Text The SendGrid API Key taken from the SendGrid account of choice. User Text Login name for the SendGrid server. Password Text Login password for the SendGrid server. Users have the option to store their password inside the component but we highly recommend using the Password Manager option. Data Source Choice Select a data source from the server. 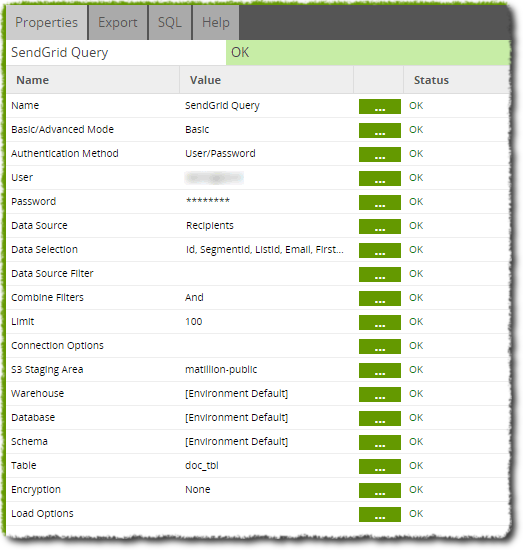 In this example we will be using the SendGrid Query component to stage data directly from SendGrid to be later transformed. The Orchestration job setup is shown below. 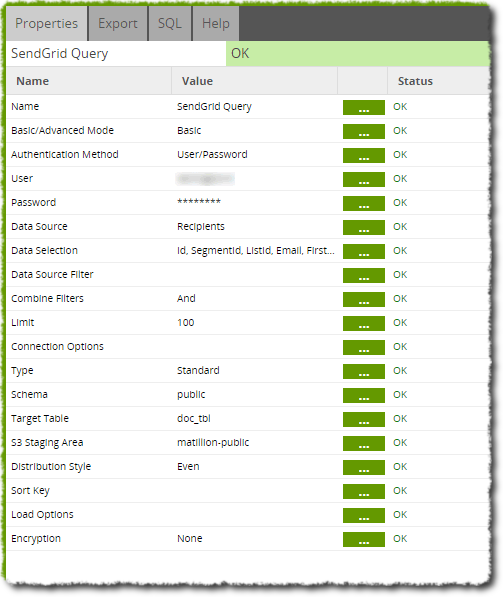 Note that we do not need a Create/Replace Table component and the SendGrid Query component will drop and recreate the specified table before being loaded with data. A username and password are entered for the component so that it can connect to our SendGrid account. The password has been stored securely using the Password Manager inside Matillion ETL. Several Data Sources are available and we select the 'Recipients' data source on this particular occasion. 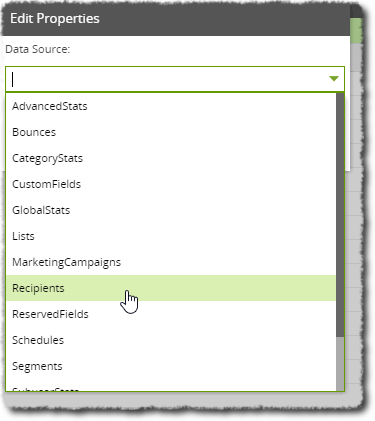 Only a single data source can be selected per component, although we could use multiple SendGrid Query components if we needed. Once set up, the job can be run. The Transformation job linked at the end of the job will automatically run at the end of the Orchestration job, allowing our newly-loaded data to be transformed as part of the process. We can also sample this data using a Table Input component to verify our load has completed as expected.